This entry is the second of a two-part series on waste diversion and landfilling practices in the Regional District of East Kootenay (RDEK). In this post, Wildsight’s Kimberley Cranbrook branch tours RDEK waste transfer and landfill facilities. For transplants to the East Kootenay, it may come as a surprise that our solid waste system as we know it is just coming out of its teenage years. 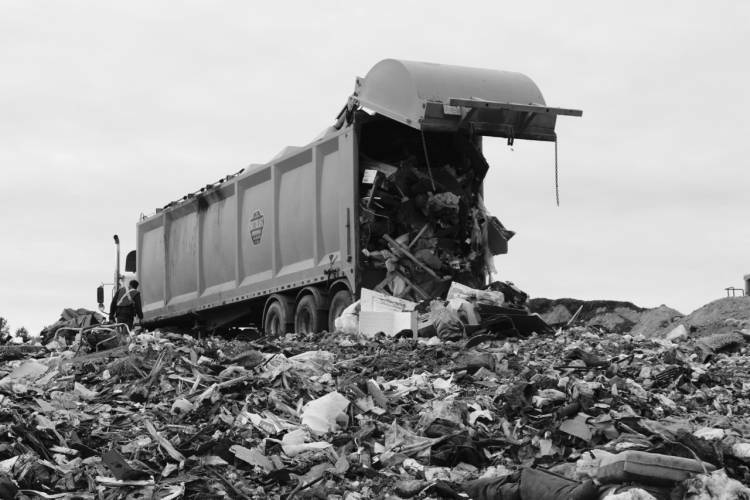 According to RDEK Solid Waste Superintendent Jim Penson, prior to 1999, “there was no system. Every town had a landfill, a little hole in the ground”. Since then, the old dumps are now dormant or closed. What many of us now call “the dump” in our own communities are in fact the RDEK’s Solid Waste Transfer Stations, where materials are either diverted or sent to our region’s Central, Elk Valley or Columbia Valley landfills. For their part, municipalities conduct curbside pickups, depositing collected waste at local transfer stations (also open to the public seven days a week). Mixed recycling accounts for just under one third of the materials diverted from our region’s landfills. Each transfer station includes a number of additional streams for waste diversion, which could include: clean wood, scrap metal, tires, white metals, mattresses, propane tanks, asphalt shingles, arborist and green yard waste. Destinations vary by material; clean wood is chipped and sent for cogeneration (power production) at local mills and many other materials are sent back to producers for product stewardship. Diversion also includes the ever-popular (but logistically burdensome) Re-use Sheds residents use to swap unwanted but still useful items. At staffed transfer stations, diversion is a reasonably successful practice, though it doesn’t combat the negligent dumping practices hidden within opaque black bags. Take clean cardboard, for example: an estimated third of our recyclable cardboard is incorrectly deposited by residents in the main solid waste sheds, not our yellow bins. 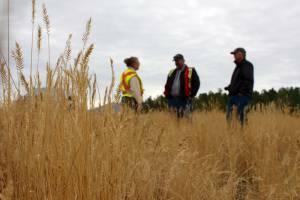 If diversion is a challenge at the Regional District’s staffed Transfer Stations, it’s virtually non-existent at unmanned rural sites like those in Wasa, Canal Flats, Fairmont and Koocanusa. Landfill Operator Keith tells us “at least $100 per day comes through in returnable bottles” from the unmanned stations. Clean wood is the next most valuable commodity to be unfortunately landfilled. Landfill Operators see improperly dumped recyclables and clean wood arrive from unmanned transfer stations daily. Ours is one of the few Regional Districts in the Province of BC that still uses unmanned sites, and in fact they’re in their twilight years. When asked if the transition to strictly staffed transfer stations would mean an increase to illegal dumping practices, Jim Penson thought the gains (to diversion) far outweigh the costs: “The Regional District of North Okanagan recently closed their unmanned sites, and didn’t spend a tenth of their illegal-dumping cleanup and enforcement budget in the first year”. Solid waste that can’t be diverted in Kimberley-Cranbrook, and more recently the Elk Valley, is sent to the Central Landfill in Fort Steele for what’s referred to as “storage”. In truth, very little biodegradation takes place in landfills: archaeological digs at some American landfills have revealed 25-year-old lettuce in perfect condition. The Central Landfill sits on 300 feet of clay material, creating an impervious shell protecting the area’s groundwater from contamination. A series of nine monitoring wells on site monitor any impacts to the groundwater. Thanks to the clay substrate, our dry climate and modern dumping practices, anaerobic decomposition is almost nil, and its methane gas by-products virtually undetectable. This is a rare case in a province where many landfills routinely flare methane or else ban organics to stop production of the greenhouse gas. To achieve this, active landfill sections, referred to as “cells”, have to be covered daily. To save space and material, the RDEK adopted the use of alternate daily cover: a matrix of heavy metal plates with watertight rubber seals. Household yard and garden waste is composted in windrows, then used for green cover of closed cells. The macro- and micro-biotic life within the green cover help consume any trace amounts of methane leaving the cell’s surface. Once cells are built to their maximum height, they are capped with a meter of clay substrate, top-soiled and seeded with grass. Over seven kilometres of electric fencing ward off wildlife intrusion, food-conditioning and conflicts. Wildsight and RDEK representatives stand above a closed landfill cell. What becomes, or will become, of household organics? The RDEK conducted a pilot project to test the feasibility of region-wide organics diversion in 2016, but the project’s upscaling was challenged by economies of scale: the volumes collected are small compared to those processed at purpose-built facilities. Collection and transportation of solid waste remains under the jurisdiction of municipalities, so the region’s municipalities would have to collaborate with the RDEK to make organics collection operational. 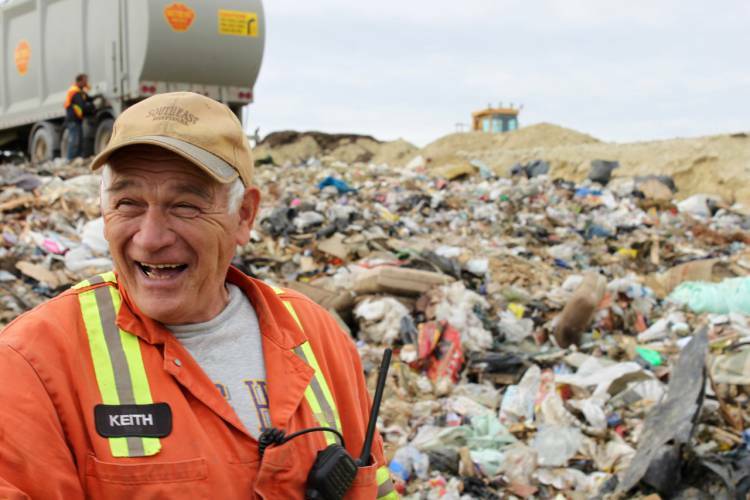 Because there is little concern for methane production at the current landfill site, there is less pressure on the district and municipalities to collect and divert household organics. The Central Landfill has an estimated one hundred years of life left before closure. According to Jim Penson: “we’ll never need as much land as we have [available]. In twenty years, I doubt we’ll be burying garbage; the province won’t allow it”. Solid waste diversion and storage practices are changing at an increasing rate, and policy-makers are looking to examples in Europe and forward thinking American cities to match their standards to. How close is our region to the 100 percent diversion goals set by other cities? Pretty far, in fact. As of 2015, 10 percent of materials were recycled, 23 percent were diverted, 67 percent were landfilled in the RDEK. The RDEK is taking strides forward in diversion every year. One shining example is the District’s mattress recycling pilot, which saw nearly 600 mattresses collected over four months at Cranbrook’s Transfer Station. 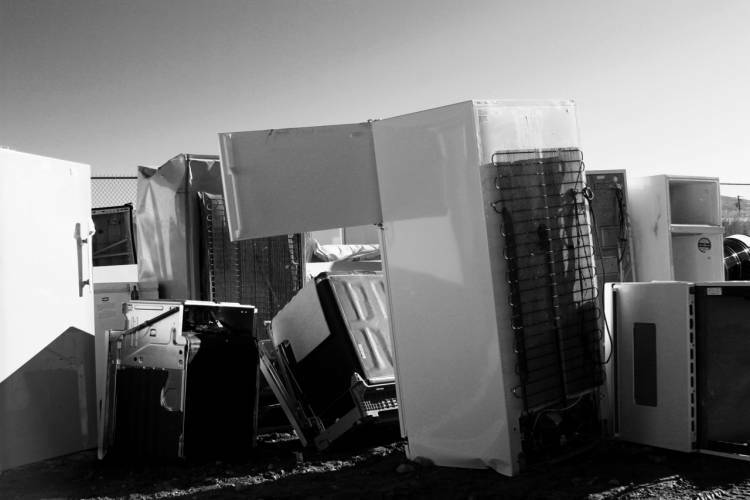 The mattresses were sent for breakdown and recycling in Calgary, where every component in the mattresses, from the springs to the foam, was recycled. With a solid waste system that is managed largely by users, we could be doing better as citizens to reduce and divert waste at the household level. While curbside municipal composting waits for broad policy change and upgraded infrastructure, backyard and vermiculture composting are today’s viable options to treat the 30 percent plus organic content of our household waste bins. Though product stewardship, recycling and diversion are valuable tools, the system works only if we’re knowledgeable and using it correctly. Reduction of these materials at their source (the point of purchase) is even more critical. China, by far the largest importer of global waste and recyclable materials and the recipient of much of Canada’s recyclables, has recently announced it will ban the import of these materials by the end of the year. Many Canadian municipalities are already being faced with land-filling their recyclables as a result of this decision. After all, our solid waste system turns eighteen this year, and every teenager needs a bit of guidance. White metals are just one category of diverted goods, but there’s still too much of them.